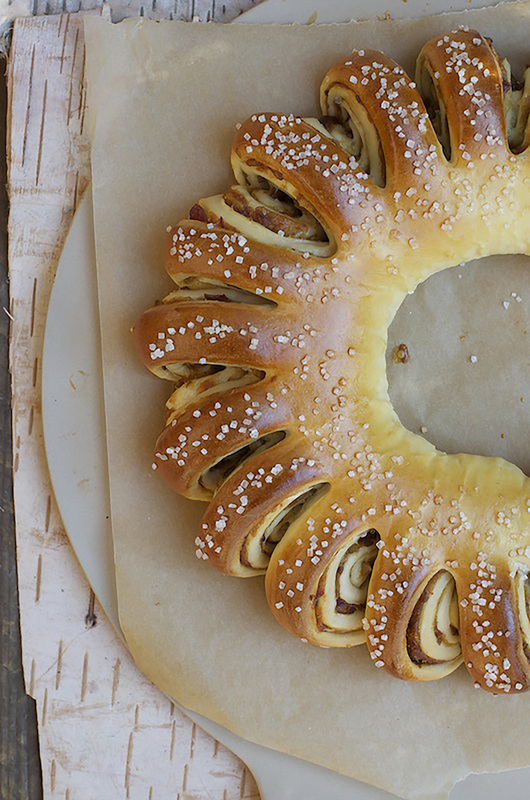 A Tea Ring is one of the most traditional yeast breads. It is versatile, allowing a choice of filling. It is attractive with a distinctive shape and perfect for any occasion. Prepare Filling or Fillings of your choice. See directions below. In large mixer bowl, combine 2½ cups flour, yeast, sugar, and salt; mix well. In saucepan or microwave-safe bowl, heat milk, water, and butter until very warm (120º-130ºF; butter does not need to melt). Add to flour mixture. Add 2 eggs. Blend at low speed until moistened; beat 3 minutes at medium speed. By hand, gradually stir in enough remaining flour to make a soft dough. Knead on floured surface until smooth and elastic, 5 to 8 minutes. Place dough in lightly oiled bowl and turn to grease top. Cover; let rise until dough tests ripe, about one hour. Punch down dough. Divide into 2 parts. On lightly floured surface, roll each half to a 15 x 12-inch rectangle. Spread with Filling. Starting with longer side, roll up tightly. Pinch edges to seal. Form ring, pinch ends to seal. Place each ring seam side down on greased cookie sheet. With scissors, make cuts 1 inch apart through top of ring to 1 inch from center. Turn/twist each slice on its side. Cover; let rise until indentation remains after touching, about 30 minutes. Egg wash: Combine egg and 1 TBSP water; gently brush tea ring. Sprinkle with pearl sugar (optional). TIP: Pearl sugar can be found in the gourmet section of most supermarkets. Bake for 20 to 25 minutes until golden brown. Remove from cookie sheets; cool. In medium saucepan, boil sugar, corn syrup and water 5 minutes. Add cranberries. Cover and cook 4 minutes, stirring occasionally. Add chopped dates; cook 1 minute. Remove from heat; stir in nuts and lemon juice. Cool completely. TIP: If using frozen cranberries, increase cooking time. In small bowl, combine brown sugar, cinnamon, and nuts; mix well. Spread rectangle with butter. Sprinkle with filling. In small saucepan, combine poppy seeds and milk. Bring to a boil. Simmer about 5 minutes until milk is absorbed; stirring constantly. Add sugar; cook 5 minutes longer. Beat egg slightly. Stir a little of the hot mixture into the egg; add the poppy seed. Cook until thickened. Do not boil. Remove from heat. Stir in nuts and almond flavoring; cool completely. In small saucepan, combine all ingredients. Bring to a boil. Simmer about 3 minutes, until thickened; cool completely. If filling is too thick to spread, add orange juice to thin. In small bowl, combine brown sugar, walnuts, and cinnamon. Brush maple syrup over each half of dough. Sprinkle with sugar and nut mixtures. This is a wonderful recipe. It is easy to make. I watched a TV show called creative living where they explain how to roll up, twist and cut the T ring before the 2nd rising. It is beautiful too. I used a sugar glaze topping.. just confectioner sugar, milk and a smidge of butter. These are great even a couple of days old.. just put a piece microwave for 15 seconds. I baked mine for a 15 minutes.. it seemed too dark when I went up to 20. I think I have an extra hot oven.. just something to remember. Use parchment paper under the tea ring when you bake.. it will help alot!!! !